A while back we talked about an online creative suite called Aviary. This weekend the Aviary team is shaking things up a bit and launching what they call 30 Days of Roc. As part of the promotion, over the next 30 days the Aviary team will be adding a total of 50 musical instruments to their online Music Creator webapp, Roc. 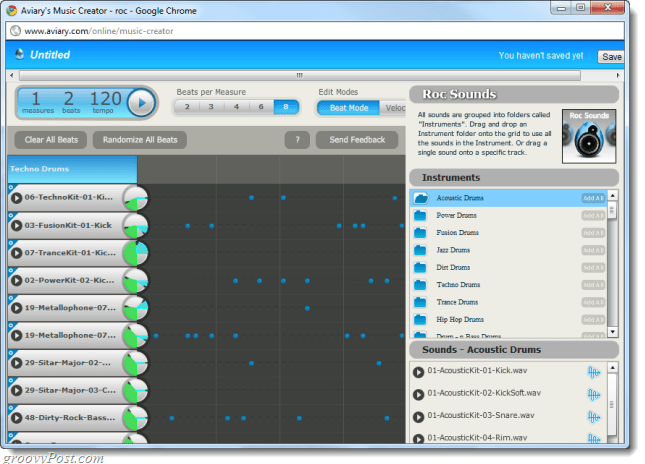 If you aren’t familiar with Roc, it is an online music creating web app that runs completely in “the cloud.” It is similar to what some may have used before with JamStudio, but Roc does a way better job at it. Roc has a familiar set of instruments, a variety of beat measurements, and an easy to use interface. Now previously we spoke of Roc as being just a beat maker, but with the introduction of all these new sounds I think that you’ll be able to quite a bit more than just beats; if you are creative enough you could make an entire song! To start things out, they’ve already released a set of 5 Human Beatbox packs that contains multiple sounds in each pack. Subsequent releases will happen Monday-Friday for the next month. If you’d like to hear a preview of what you can do with the new voice pack, Aviary user Styromus has created a brand new track that you can preview here. To stay up to date on the release of new Roc sounds by visiting Aviary’s blog, where they will be announcing updates as they take place.